Before I go into some detail, I will sum up the day in a few words that were spoken by the team: special, blessing, intimate, and heaven. Our day started bright and early at 5:45; thankfully Tom made us some nice, strong Haitian coffee (as he always does). Our amazing security guy on duty dropped us off about a mile down the road at a local baptist church where we got to spend an hour or so singing, shouting, and dancing in worship to our Creator. It was a very special experience, yet very different than what most of us where used to, but beautiful that we were so welcomed in, as foreigners, to worship as one Church. Next we took a very bumpy drive across Port-Au-Price, to a desert-like town by the sea called Titanyen. 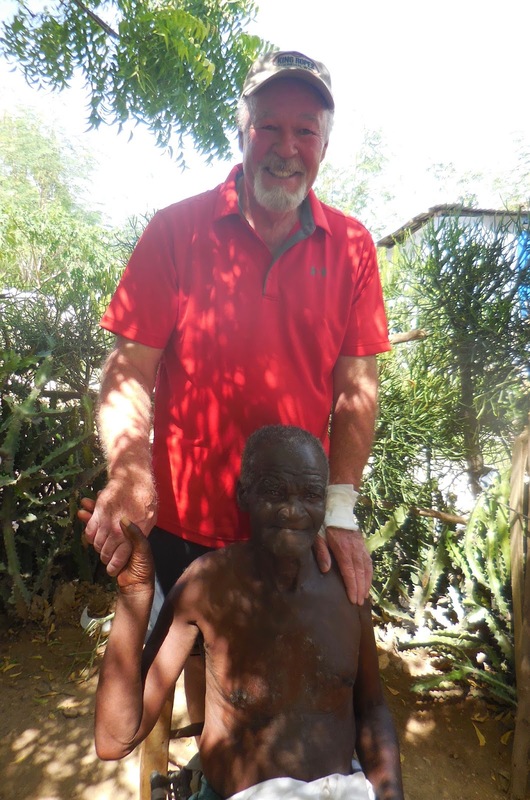 Here we visited four elderly adults to bring them some food and drink, wash their feet, sing worship songs, pray, and provide whatever other basic care we could give. I will never forget one man in particular, Lindor, the joy of the Lord in this man’s being is inexpressible. I can name on my two hands the items that he can claim to his name and the meal we brought him was quite possibly the only meal he would eat that day, and yet he had everything-the presence of the Lord was so clearly alive in him and all he wanted from us was prayer for his eternity. The rest of the afternoon we spent in Grace Village (a 50 acre gated plot of land in the mountains neighboring Titanyen). 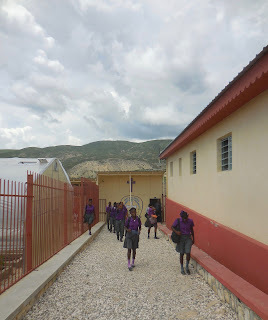 Grace Village consists of a school that educates over 400 children ranging from 3 years old to mid-twenties, an orphanage of 41 children, Grace church, a bakery that supplies the community with up to 50 jobs, and a restaurant with some great pizza. Rejoining our team tonight was a really beautiful few moments-everyone a little worn out, yet so at peace and so much joy. As we shared the joys of the day, JoAnn reflected on the beauty that heaven will be when we will reunite with our fellow brother’s and sister’s from around the world in worship our great and awesome God. Morning started with our devotional and a wonderful breakfast. Once we gathered the clan we departed on the tap-tap. Our driver was Max and Valerie our guide. First stop was the water distribution center where 4 trucks are filled from the top at a time. The water comes from a well. The distribution center runs 24 hrs. a day 7 days a week. This is the water system for all of Port-au-Prince. Once the truck was filled we headed to Number 26 (an area of Cite Soliel) to provide water for the local residents. We filled 100’s of 5 gallon buckets and drums with water, which is a life source for these people, that we in the US take for granted. These are all carried by women, children and Healing Haiti volunteers. It is amazing how small children are expected to carry these buckets. It was a blessing to be able to help mamas by watching their babies or to help by carrying the buckets and tubs. The smiles of the children and the thanks-you’s from the families makes it all worth while. Our next stop was Number 21 where we got a guided tour of the most impoverished area many of us have ever seen. Valerie took us down by the ocean where we watched men building a boat by hand. One man was shaping boards with a hand chisel and one was hand planing the boards to be used on the hull. As we walked between their homes people were very welcoming with friendly greetings. It was heart wrenching to see the conditions they had to live in, and to watch children walk barefoot on layers of seashells. Our second water stop was Number 25. It seemed like it was bath day for the children as they soaped themselves and played in the water. For the adults it was more urgent to get the buckets filled. This was our last opportunity to help with water delivery while we are in Haiti. It is hard work but a blessing. Our last stop was Apparent Project/Papillon-Enterprises. This organization was founded by an American woman who initially came to Haiti to adopt. When she arrived she learned that the child was not a true orphan, but an economic orphan with a family who wanted him, but could not afford to raise him, she decided to start a business for mothers and fathers. The jobs gave them the ability to keep their own children at home. There is a daycare which provides care at no cost to employees. 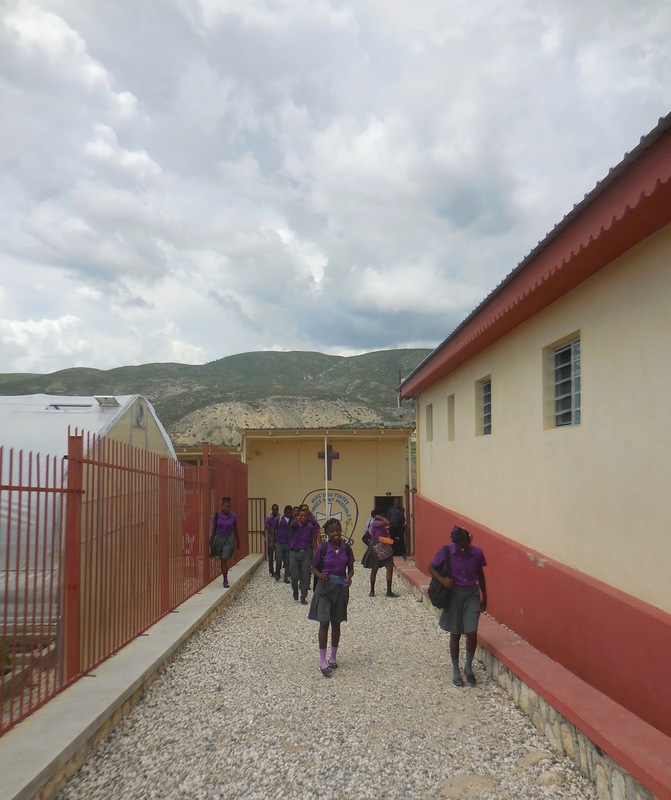 She began with a small number of Haitian employees and has grown to a company of over 200 employees. Everything is handmade here in Haiti, from glass beads to cereal box beads, pottery, stuffed toys and silk screenings. Every item is from recycles materials. After enjoying a wonderful smoothy from the restaurant and a shopping spree in their retail store we returned to a Haitian meal and our team meeting. For I was hungry and you gave me food, I was thirsty and you gave me drink, I was a stranger and you welcomed me, I was naked and you clothed me, I was sick and you visited me, I was in prison and you visited me. Truly I say to you as you did not do it to one of the least of these, you did not do it to me.